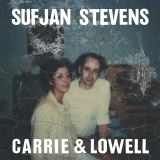 Carrie & Lowell is ranked 2nd best out of 15 albums by Sufjan Stevens on BestEverAlbums.com. The best album by Sufjan Stevens is Illinois which is ranked number 55 in the list of all-time albums with a total rank score of 38,670. Members who like this album also like: A Moon Shaped Pool by Radiohead, The Suburbs by Arcade Fire and To Pimp A Butterfly by Kendrick Lamar. The tracks on this album have an average rating of 88 out of 100 (all tracks have been rated). Related links: top tracks by Sufjan Stevenstop tracks of the 2010s, top tracks of 2015. Showing latest 5 ratings for this album. | Show all 1,092 ratings for this album. Related links: top albums of the 2010s, top albums of 2015. Beautiful album. Sad, but beautiful. I love it now but suspect it will render the same destiny as Elliott Smith, Nick Drake, Simon & Garfunkel. That is I will tire of it and never be able to enjoy again. It's so much of that beauty, and sadness, that it's almost like an infatuation, not turning in to love. But I will enjoy this beauty as long was it lasts.... a great date with good food. A bit boring but an extremely pretty girl.. Easily his most personal and perfected album. It's simplicity in sound forces you to not only hear him but listen to him and feel him. It is the darkest, saddest album I've ever heard, and every time I listen I can't help but only imagine the pain and confusion he went through after his mother passed. He is quite religious and never swears, so use of the F word in "No Shade In The Shadow Of The Cross" is utterly heartbreaking. This is very likely the saddest album ever made (at least it's the saddest one I've heard). It's beautiful and haunting, Sufjan writes his lyrics like a poet. The instrumentation is much simpler than some of his other albums which fits perfectly with the tone. It really feels like we're inside Sufjan's head as he's working through the complex feelings he has for his troubled mother. My favorite tracks are, "Death with Dignity", "Fourth of July", and "The Only Thing". Fourth of July is especially heartbreaking as Sufjan recounts the final moments he shared with his dying mother. Everyone should listen to this difficult, moving album. Carrie and Lowell is a lo-fi record but that doesn't matter because the songs are superb throughout. It's suprising that a lo-fi record would trump pretty much everything considering everything is so perfectly produced these days but it's a triumph for the song over polish. A dark but uplifting masterpiece.